Police are set to roll out a national programme to tackle cycle theft as part of a serious organised crime division, road.cc has learned. The announcement follows the closure of a London-specific cycle theft taskforce, run by the British Transport Police, and police in charge hope that by sharing information and tactics across different forces police can target cycle theft hotspots across the UK, as well as catching bike thieves involved in more serious crime. National police chiefs reveal cycle theft hot spots for England and Wales as top cop vows to "stop the scourge of cycle crime"
The national police lead for cycle theft, Supt Mark Cleland, says he will begin by providing training to 23 ‘regional experts’ in the British Transport Police, and ‘anyone who wants it’, to tackle cycle crime. He says the cycle theft is currently seen as a high value, low risk crime, with a small chance of being caught, and he wants to change that. 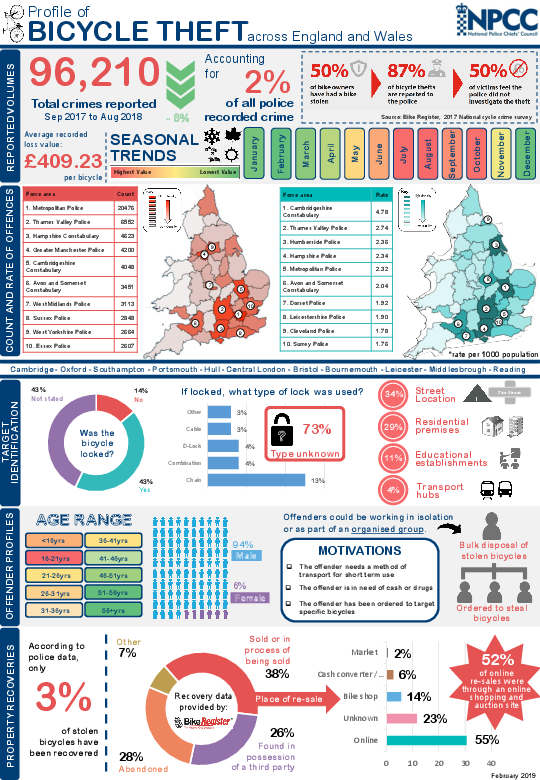 Analysis of cycle theft hotspots nationwide, produced by police crime analyst, Hannah Herbert, revealed the ‘top ten’ cities where the most bikes are stolen, as well as the time of year, and the types of location bikes are stolen from, like universities and transport hubs. Cleland notes cycle thieves are often involved in more serious crime, so catching people pinching bikes can be an easy way for police to prevent other, higher level, offences. Cleland said British Transport Police’s London cycle theft unit has been re-formed as part of Operation Opal, a new national unit focusing on serious organised and acquisitive crime. Cycle campaigners highlight the need to tackle the sale of stolen bikes, including on second hand sales websites like Gumtree and Ebay, and working with shops to register bike frame numbers to a national database that police use, BikeRegister. Secure bike parking, educating owners on bike locking, and registering their bikes, can help reduce cycle crime. Sam Jones, Cycling UK’s Senior Campaigns and Communications Officer, said: “Cycle theft isn’t a victimless crime, but sometimes it feels like nothing is being done about it. There is a clear interest from some police, and the best way to get them to take it seriously is taking time to report your bike stolen. Even if the police can’t do anything about it, at least they know the scale of the problem. “We can also be responsible in our own purchasing; when you see that deal on Gumtree or Ebay, if it seems too good to be true it probably is. Always check to see if the original ownership papers are available before considering a purchase. Research shows 24% of people who have a bike stolen stop cycling.